It took me a while to decide what to write this blog post about and I finally decided to go with the topic of long distance relationships. I chose this particular topic as I know someone personally who’s in one and thought I would give my views on this topic having observed it and also from my own perspective. New age technology and social media have made if far more easy for individuals to connect with one and other,and maintain a relationship through these means regardless of ones location. You are able to not only talk via the phone but also through video calls or messaging services. 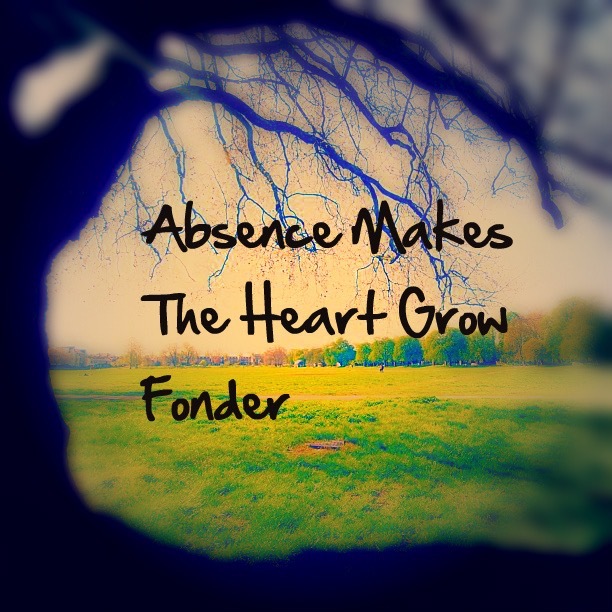 We have all heard the saying “absence makes the heart grow fonder” and this is definitely true. We miss those that are away from us for as little as one week so one can only imagine how heightened it will be over a longer period. Little things such as kissing or even holding hands that some of us take for granted will mean so much. Missing someone makes it more exciting when you finally get to reunite, time becomes more precious. Traveling is always fun especially if it involves you traveling to another country. If that country is hot even better right?. Another bonus is also stacking up on your air miles which will give you great rewards. There is so much to explore in a place you are not from. Sites to see, activities to get involved in and food to indulge in and this makes a long distance relationship perfect. You can both experience new things together. Although I have visited the positives there are also barriers that some may describe as negatives. Time difference can prove to be a problem especially if it’s a big one, which means for instance your night time is your partners morning . A clash in schedule will mean you may be available to talk at a particular time whereas your partner may be working at the same time or vice versa. This will result in a lack of communication. However where there’s a will there’s a way. Communication is key in any relationship regardless of the distance between you and your partner. However It can become more challenging to communicate effectively when you’re in different parts of the world. Disagreements may not get resolved as quickly as they should as misinterpretation can occur over the phone or via messages. A face to face argument can be resolved far more quickly. When the dust settle couples are able to kiss and make up reassuring their other half that all is well. 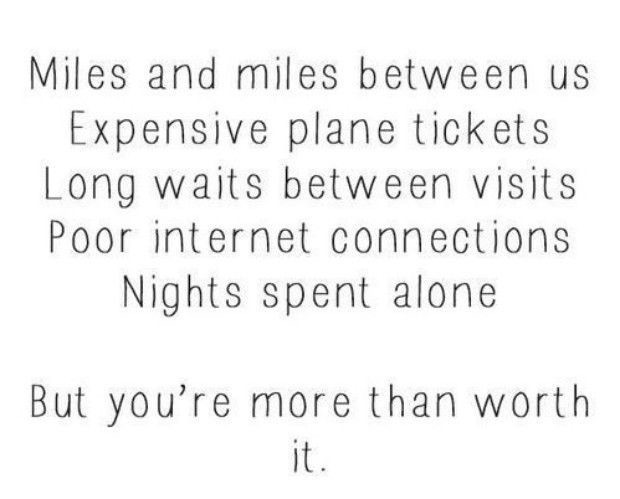 This can not be done in a long distance relationship. Some could argue that this is a positive, living further apart means one is able to have space and a cool off after an argument. Financial strain can take its toll on a long distance relationship with traveling to and from a particular destination. This could result in one or both individuals not being able to see the other as frequently as they may like or may have previously discussed. There are always going to be individuals around you such as your family and friends who have a view on long distance relationships. They may therefore try to discourage you but ultimately it’s down to you and how strongly you feel for the person in question and wether you see a future with them. Personally I have always commended those that are able to be in a long distance relationship. It takes hard work ,discipline, trust and commitment to make it work which are great attributes. Many are not open to the idea of a long distance relationship, perhaps due to the effort that has to go into it or not being able to physically be with their partner. However, I do believe that one should be open to the idea and not write it off completely. We do not know what the future holds for us which means the person you’re destined to be with could be on the other side of the world. If you meet someone but circumstances means you have to be apart does that mean the end for you both? Should that be a barrier? Thanks for reading, I would love to know your views on long distance relationships. I wrote a post last month on the topic of “How long is too long to wait between engagement and marriage”. 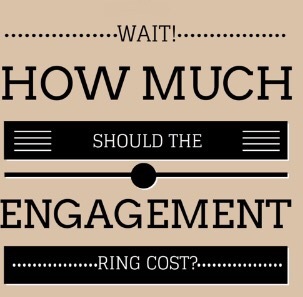 So I decided to stick to the topic of engagement, this time in regards to the price of the ring. I have come across a lot of articles that suggest that and individual should spend 2 to 3 months of their salary on an engagement ring. My immediate thoughts were, who came up with this notion because it’s frankly ridiculous in my opinion. An engagement ring is symbolic as it shows both love and commitment but society as somehow turned it into a way to make large amounts of financial gain in the process. I certainly do not believe their should be a fixed rule on how much should be spent on the ring as everyone’s monthly wage and responsibilities differ. Personally I believe an individual should spend what they can afford to on the ring, and it shouldn’t leave one broke or in debt. Although I don’t think hundreds need to be spent on the ring an extremely cheap ring is also not appealing. An engagement ring will be worn with pride and also for the duration of your lives together, so yes price does matter to a certain extent. I mean you can do better than a £50 ring from Argos and I am sure many would agree. I am not materialist and genuinely care more about the thought that went into it than the actual price, but I hear way too many people say “it can cost £10 I don’t care” but most don’t really mean that, let’s be honest. I don’t want a ring that someone wears as a day to day ring to be my engagement ring but I would also never ask my partner how much the ring cost so would be none the wiser. One can only hope. I would like to believe that if I am going to be engaged to my partner I know them pretty well and should trust their decision in choosing the perfect ring for the perfect price that they can afford. At this stage in our relationship I should be aware of my partners financial circumstances and will certainly not want them to go above their means and would be annoyed if they did so. Although we all want a lovely diamond, it is also important to look at the bigger picture. This ring is just the first stage and just the start of the money that will need to be forked out towards our future. There is still the actual big day itself ,wedding ring/band, the honey moon and our lives after marriage, just to mention a few. Family and friends shouldn’t influence how much you spend on the ring but they do. Family do tend to give their unwanted views a lot in situations such as this, but in all honesty it is none of their business and the price of the ring should be solely down to you the buyer. I have read many threads about parents of the bride not being happy with how much was spent on the ring. Number one I think it’s rude for ones parents to ask the price of the ring and secondly the soon to be bride shouldn’t be telling them the price. This is quite personal information that like I mentioned above I wouldn’t even want know. In regards to friends I think you can ask them to accompany you when picking out the ring just to maybe get a second opinion but never about the price. Individuals watch their friends propose and believe they need to buy a ring of a similar price or look but it is not a competition and not everyone has the same budget,don’t leave yourself out of pocket trying to impress others. The only person you should want to impress is your soon to be fiancé who will actually be wearing the ring and be starting a future with you. To conclude, an engagement is more than just the financial element. You can spend a large amount on a ring and your partner may not even like it because it’s simply not their style. You need to listen to the types of ring your partner describes when your conversing. Look at the style of ring they show you when you’re out and about and use those details to ensure the ring is perfect and not the price. Never allow outside influence to pressure you into spending more that you are capable of on the ring, because the only person that will be in financial strain is yourself. Thanks for reading, I would love to know your views on this topic? I know I know it’s the 21st century, what may not have been the norm a few years ago is now the norm. However in regards to a woman proposing to a man my views are very much old school/traditional let’s say and I am sure I am not alone. Let me be honest, I give absolute props and admiration to women that propose to men, because I certainly wouldn’t have the balls to do so. This shows so many attributes, confidence being one of the ones that stand out, which I would commend her for. It also shows us that she will go for what she wants despite what society makes us believe is to be expected and the stereotypes that exist. The media definitely plays a significant role in shaping our views on this topic. We are constantly shown images and videos of a man proposing to a woman. Engagement rings that are constantly advertised are very gender specific and aimed for women. Of course a woman proposing to a man does not occur as frequently as a man proposing to a woman. However it does happen and scenarios such as this should be portrayed. Personally I cannot picture myself taking the steps to propose to my man, of course I can never say never but it’s very very unlikely I should say. I have imagined and pictured from a young age how amazing a proposal would be and it has never involved me being the one that’s asking for a partners hand in marriage. As women the majority of us strive for equality and rightly so, but I do believe in some aspects of life there are some roles a man should take and some a woman should take. For me I would like my man to initiate this and take the lead in this aspect of moving our relationship forward. This is just my personal opinion and preference; however I am a strong believer that as individuals we should do what we want to do regardless of what is considered to be the right way. Who decides what is the right way anyway? The answer is it comes down to you, the final decision lies in your hands. Don’t base your actions on the opinions of others, if you want to make your boyfriend your fiancé then go for it. I am a woman so I cannot put myself in a man shoes, so I teamed up with my fellow relationship blogger friend Josh for this one so I could get a male perspective on this topic . When Tin told me about this topic, my immediate question was – Why would you as a woman even feel the need to propose to your man? I get the man and women are equals and if can man can propose, the woman should be able to do the same if she wants. That being said, being equal doesn’t mean we are the same. One of the differences is our ego. We men have a special relationship with our ego and a lot of time we make decisions based on how it stimulates our ego. I’m not saying you cannot or should not propose to your man, but you saying yes to us would do more for our ego, which affects how we see and appreciate you than us saying yes to you. – We are not yet ready to get married because we cannot guarantee that level of commitment or we’re still chasing other things. So why would you even want to propose to someone that’s not in a state to get married to you? I have found that some women just want to believe what’s in their head, regardless of what’s staring them in the face. No MAN is too shy or scared to ask for what he really wants, so don’t feel the need to take the initiative on our behalf. Also if you are going to take the lead, you have taken what makes us feel like men, so don’t be surprised when you end up with a boy, and you have to take the lead on everything – money, bills, kids, school etc. I can imagine how frustrating it can be for a woman waiting on her partner whilst factoring age and her close friends getting married. However if we have a good thing, I’d rather her ask me about my intentions than her proposing to me. When I proposed to my wife, that worm I had in my stomach when I asked her parents, bought the ring, getting down on one knee and hearing her say yes was priceless. It felt like I won the lottery and it could not have been the same if she had proposed to me. I probably would have laughed and thought it was a prank. From researching this topic the most common reason as to why people take the idea of a prenup personally is that they believe it shows a lack of trust. They also see this agreement as preparing for the end of the marriage before it has even begun. Others that are for the idea of a prenup see it as just protecting their assets and nothing personal. They don’t see it as taking away from the marriage in any way. I can understand the argument both for and against signing a prenuptial agreement. On one hand if you trust someone whole heartedly and believe your both in it forever, what is the point of signing it. Others would also switch the argument and say that if you do see it as forever what is the harm in signing it, after all it will never come into play if we don’t break up. I am not married neither about to enter marriage but as of now I find myself leaning more towards not having to sign a prenup/having my partner sign one. The idea of having to sign an agreement pointing out what will occur if our relationship ends before saying ‘ I DO” just simply doesn’t appeal to me. It just seems like a negative way to begin a relationship. I have always grown up with the concept of when you enter marriage”whats yours is mine and whats mine is yours” and personally I believe a prenup dismisses this to a degree. We are becoming one after all, is that not the concept of marriage? Moreover, I like to look at both sides of an argument and when writing this post I was able to understand the mindset behind some wanting to have this agreement in place. If you are fully financially established before entering the relationship does your other half deserve half of that money which they didn’t work for or contribute towards in any way in the case of a break up? Probably not, unless kids are involved or the other party commited adultery. A fair scenario would consist of the money accumulated by both of you whilst in the relationship and the marriage to be shared between you both equally if a divorce occurs. However, without a legal contract(a prenup) in place would this be the case. Another reasons why a person may want to have a prenup in place is due to them believing a person could be marrying them solely due to their financial status or what they can gain from the marriage(gold digger). However if in any sort of doubt or worry should you be marrying that person to begin with? Probably not! You should know your partner in and out before a decision about getting married is made and finances should have definitely been discussed by this point . We are all going to have a different opinion on subjects such as this. If you and your partner find yourselves in disagreement over the topic of prenups I think its important to respect one and others decision and ensure both view points are heard and understood. It is a touchy subject so if a person is apprehensive and upset about the idea of signing a prenup initially let them warm to the idea. Ensure you are honest and let them know the reasons you believe a prenup is the right way to enter the marriage. Moreover if someone is against signing a prenup you should also take their opinions into consideration. The reasons why they are against prenups may allow you to view the subject in a different light. Personally I do not agree with prenup as I feel it is a threat to making successful marriage happen. With divorce becoming increasingly popular, I understand that people feel the need to secure their finances, however I feel that mentality makes it difficult for marriage to thrive. It’s basically walking into a union designed to be eternal with a transient mind set. Marriage as lovely as it can be, comes with its challenges and going into it half-heartedly would most likely result into the marriage failing. For me, asking for prenup is not just a question of trust but also a question of how much value you feel the other person can add to you. So if you are unsure of your partner’s worth and value, should you be getting married to them? If myself and my partner worked hard together to build some fortune but the marriage ends up in divorce, she’s definitely entitled to half because we worked for it together. On the flipside, if I was already made (financially successful), I would love to think I would be wise enough to marry someone that’s financial compatible or at least has enough about her to add value or complement what I already have going on. When you are in a strong financial position, you attract all sorts and it would be near impossible to tell who loves you for you or who loves you for what you can offer them. If you are not fortunate to have someone that’s been with you from the start, then it is important to use the dating period to better understand the person you’re with and the values they possess that would complement or add to what I already have going on. The values do not always have to be money oriented; basically if your physical qualities were taken out of the picture, what else are you bringing to the table that can make your partners life better? If someone was to ask me for prenup, I will walk away from that relationship because I would not want to be with someone that feel I cannot add any value to them. Thanks for reading, We would love to know your view on this. 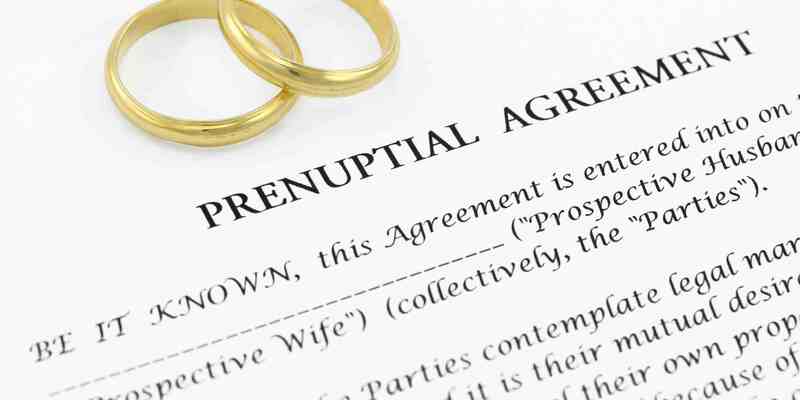 Are you for or against a prenup?